Okay, I know it's the middle of August and everyone has fall shopping on their minds, as do I, but lets not overlook all the summer sales that are currently taking place. Most stores are looking to clear out their summer items, making room for fall merchandise, meaning you can score some great deals on those summer pieces that you have been wanting to add to your wardrobe. Just about everywhere you shop, there is a large sale and clearance section, not to mention that a lot of places are offering discounts on top of their already marked down items. Now, I'm not recommending that you go out and buy that super trendy romper that you'll only wear once before the temperatures cool off, but stock up those pieces that will be in next summer, or with the right layering techniques, you can wear well into the fall . Just because the temperatures will be dropping, doesn't mean that I'll be putting away my off the shoulder tops. If fact, I'm excited to wear them this fall. I'm loving the two tops above, and how great will they look with a pair of black distressed jeans and pumps for drinks with the girls? Camisoles have found their way back into style (if only I didn't get rid of all my silk ones last year) and not only are they great to wear now on a hot day, but they make the perfect layering pieces for under a blazer or jackets. How pretty is this H&M cami and at under $10 it's a no brainer! One of my favorite things is transitioning summer dresses for the fall by pairing them with tights, boots, sweaters and leather jackets. Sometimes I even wear them over jeans. I love a good juxtaposition, and pairing this ultra feminine Joie dress with booties and a black leather jacket, will give me that sweet girl meets downtown look that I crave. I'm a big fan of wearing little jackets in the fall, and in love with this fringe bottom one from Tularosa. Not only is it the perfect piece to throw on a cool summer night, but it will be great when those cooler temps arrive. And lets not forget about those classics that may be on sale, such as a great denim skirt or black pump. ASOS: Final clearance, up to 70% off. Banana Republic: Take an extra 40% off sale. H&M: Final clearance, up to 80% off. J. Crew: Take an extra 30% off sale styles with code REFRESH. Saks: final sale, up to 70% off. and of course, I love the sale sections of Nordstrom, Revolve, and Shopbop. I'm still buying so many summer clothing because of the great sales that are going on now! Love your selection! Considering that it's basically warm in California until November I'm definitely still buying summer pieces! I'm loving all the sales! 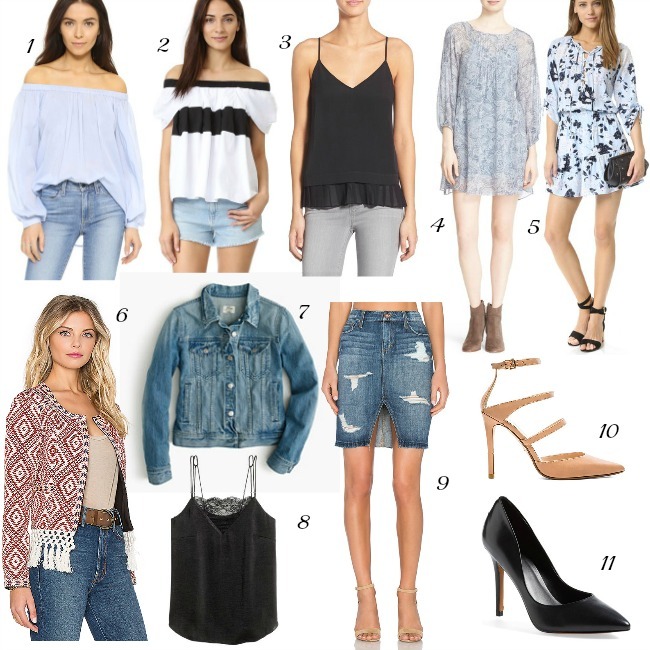 I love snapping up last-minute summer pieces at the end of the season- you can score some amazing deals!